I need to compare two files in my project, which is written in C#. Can I integrate WinMerge (or any other diff tool) with Visual Studio and use it easily from within? here you must select Configure User Tools and then select Add. after that, from opened dialog box enter . * in Extension field and set Operation to Compare and into Command field enter WinMerge executable path and select OK. There is a more detailed answer on paulbouwer.com life and technology Replace diff/merge tool in Visual Studio Team System with WinMerge article, having also what arguments you need to pass. I have been using Visual Studio Team System 2008 for a while now and am really starting to like the tightly integrated source control and work item functionality. One thing I cannot get used to is the basic diff/merge tool. Where is the detail ? Download WinMerge and install it. Open Source Control > Visual Studio Team Foundation under the Tools > Options menu in Visual Studio. 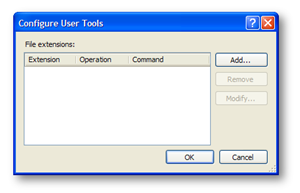 Click on Configure User Tools … and the Configure User Tools dialog will become available. 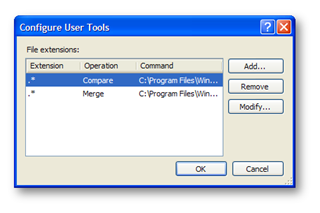 Add the WinMerge details for the Compare Tool. Click on the Add … button on the Configure User Tools dialog and configure as per the screenshot below. The arrow button next to the arguments text box exposes details about the information that Visual Studio can provide the tool being configured. 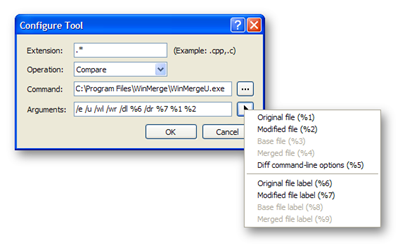 Add the WinMerge details for the Merge Tool. Click on the Add … button on the Configure User Tools dialog and configure as per the screenshot below. The arrow button next to the arguments text box exposes details about the information that Visual Studio can provide the tool being configured. 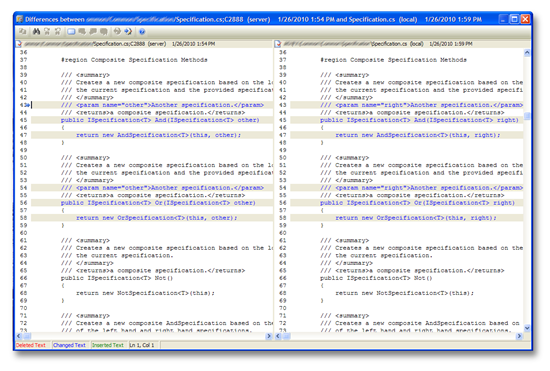 The Compare and Merge Operations should now be configured to use WinMerge. 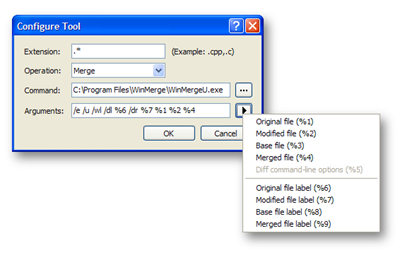 WinMerge contains a number of command line options. The following are the ones used in the configuration above. /e Enables WinMerge to be closed with a single Esc key press. /u Prevents WinMerge from adding either the left or right hand side file path to the Most Recently Used (MRU) list. /wl Opens left hand side as read-only. /wr Opens right hand side as read-only. /dl Description for left hand side title bar. /dr Description for right hand side title bar. Finally a decent diff ! Now a Compare in Visual Studio is more meaningful, It shows the number of differences, their positions within the compared files and actual differences per line. 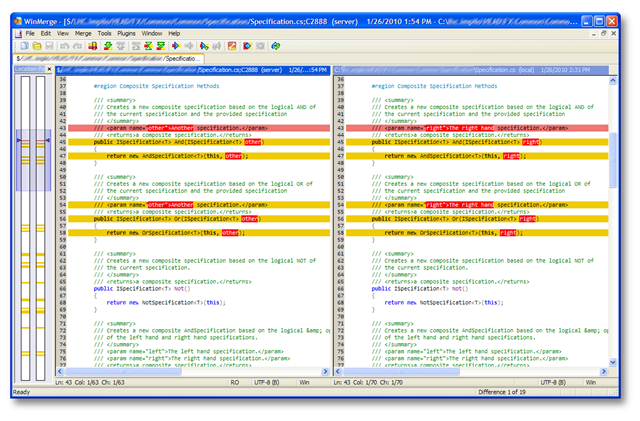 WinMerge supports custom syntax colouring and diff colouring. I tested it, and I couldn't make changes go to to my local file, so I followed the Youen's advice on that page of removing the \wr parameter for Compare operation and now it works nice! Not the answer you're looking for? Browse other questions tagged visual-studio-2010 tfvc winmerge difftool or ask your own question. How to ignore SVN folders in WinMerge? Visual Studio Diff Tool - When is Editing Allowed?